Tired of going to McDonalds for the kids birthday parties? Want to try something different and more interactive for their next party? Why not try Slot Car Racing! Our parties are fully hosted. 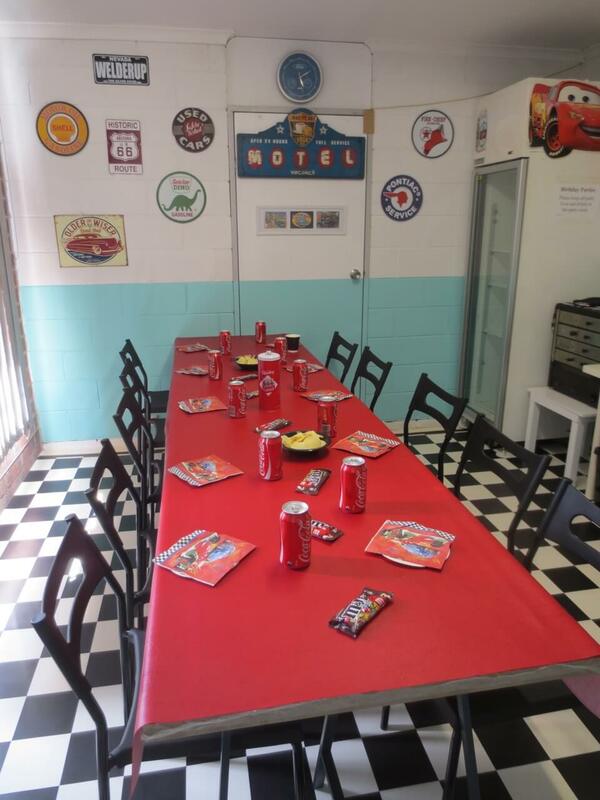 Thunderbird Raceway is air conditioned and has a dedicated party room for your comfort & convenience. For ages seven and over. Birthday parties can be booked for the following times. A $50.00 deposit is required at time of booking. Any time we're open, our seven tracks and drag strip are available for casual use. You can either bring your own cars, or we have cars available for hire. No booking is needed, however we do often get busy during the weekends, so if you are with a large group you may want to phone ahead. Lane hire + car and controller hire & use of 4 tracks with a minimum age of 6 years old. All of our tracks (both 1/32 and 1/24 scale) and our drag strip are compatible with most commercially produced 1/32 scale slot cars. Similarly, our 1/24 scale tracks and drag strip are compatible with most commercially produced 1/24 scale slot cars. However, hand controllers sold with most home racing sets will not be compatible with our tracks. Slot car racing makes for a fun and exciting club or corporate event and our large facilities can comfortably handle up to around 50 people. We generally make our raceway available for venue hire during the evening outside of normal opening hours. For more information, please get in touch with us, we'd be more than happy to discuss your event needs and requirements. Thunderbird Slot Racing is a long time supporter of the South Australian slot car racing scene. Through our resident slot car club, SlotMasters, racing is run on Wednesday and Friday evenings across a range of classes. We even have 'Rookie' or beginners racing on Friday evenings starting @ 7.30. We strive to make our racing atmosphere fun, friendly and accessible, regardless of skill level. If your interested in joining us, or would like to know more, please don't hesitate to visit us in store for a chat, or get in touch with us.